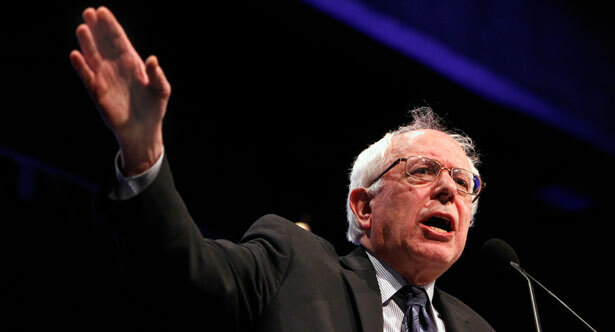 Bernie Sanders says he is “prepared to run for president of the United States.” That’s not a formal announcement. A lot can change between now and 2016, and the populist senator from Vermont bristles at the whole notion of a permanent campaign. But Sanders has begun talking with savvy progressive political strategists, traveling to unexpected locations such as Alabama and entertaining the process questions that this most issue-focused member of the Senate has traditionally avoided. In his first extended conversation about presidential politics, Sanders discussed with The Nation the economic and environmental concerns that have led him to consider a 2016 run; the difficult question of whether to run as a Democrat or an independent; his frustration with the narrow messaging of prominent Democrats, including Hillary Clinton; and his sense that political and media elites are missing the signs that America is headed toward a critical juncture where electoral expectations could be exploded. John Nichols: Are you going to run for president in 2016? Bernie Sanders: I don’t wake up every morning, as some people here in Washington do and say, “You know, I really have to be president of the United States. I was born to be president of the United States.” What I do wake up every morning feeling is that this country faces more serious problems than at any time since the Great Depression, and there is a horrendous lack of serious political discourse or ideas out there that can address these crises, and that somebody has got to represent the working-class and the middle-class of this country in standing up to the big-money interests who have so much power over the economic and political life of this country. So I am prepared to run for president of the United States. I don’t believe that I am the only person out there who can fight this fight, but I am certainly prepared to look seriously at that race. When you say you are “prepared to run,” that can be read in two ways. One is to say you have the credentials, the prominence, the following to seek the office. The other is to say that you are making preparations for a run. How do you parse that? If the question is, am I actively right now organizing and raising money and so forth for a campaign for president, I am not doing that. On the other hand, am I talking to people around the country? Yes, I am. Will I be doing some traveling around the country? Yes, I will be. But I think it’s premature to be talking about (the specifics of) a campaign when we still have a 2014 congressional race in front of us. I want to push back at some of what you are saying. Political insiders define presidential politics, and they are already hard at work, in both major parties and in the broader sense, to erect barriers to insurgent, dissident, populist campaigns. Don’t progressives who come at the process slowly run the risk of finding that everything has been locked up by the time they get serious about running? Obviously, if I run, both in terms of the positions that I’ll be advocating, and the process itself, it will have to be a very unconventional campaign. I hear what you are saying, and I think there is truth in what you are saying. But, on the other hand, I think there is profound disgust among the American people for the conventional political process and the never-ending campaigns. If I run, my job is to help bring together the kind of coalition that can win—that can transform politics. We’ve got to bring together trade unionists and working families, our minority communities, environmentalists, young people, the women’s community, the gay community, seniors, veterans, the people who in fact are the vast majority of the American population. We’ve got to create a progressive agenda and rally people around that agenda. I think we’ve got a message that can resonate, that people want to hear, that people need to hear. Time is very important. But I don’t think it makes sense—or that it is necessary—to start a campaign this early. If and when you do start a full-fledged campaign, and if you want to run against conventional politics, how far do you go? Do you go to the point of running as an independent? That’s a great challenge to conventional politics, but it is also one where we have seen some honorable, some capable people stumble. That’s an excellent question, and I haven’t reached a conclusion on that yet. Clearly, there are things to be said on both sides of that important question. Number one: there is today more and more alienation from the Republican and Democratic parties than we have seen in the modern history of this country. In fact, most people now consider themselves to be “independent,” whatever that may mean. And the number of people who identify as Democrats or Republicans is at a historically low point. In that sense, running outside the two-party system can be a positive politically. On the other hand, given the nature of the political system, given the nature of media in America, it would be much more difficult to get adequate coverage from the mainstream media running outside of the two-party system. It would certainly be very hard if not impossible to get into debates. It would require building an entire political infrastructure outside of the two-party system: to get on the ballot, to do all the things that would be required for a serious campaign. The question that you asked is extremely important, it requires a whole lot of discussion. It’s one that I have not answered yet. Unspoken in your answer is the fact that you have a great discomfort with the Democratic Party as it has operated in recent decades. You’re not really saying whether you could run as a Democrat? I want to hear what progressives have to say about that. The more radical approach would be to run as an independent, and essentially when you’re doing that you’re not just running for president of the United States, you’re running to build a new political movement in America—which presumably would lead to other candidates running outside of the Democratic Party, essentially starting a third party. That idea has been talked about in this country for decades and decades and decades, from Eugene Debs forward—without much success. And I say that as the longest serving independent in the history of the United States Congress. In Vermont, I think we have had more success than in any other state in the country in terms of progressive third-party politics. During my tenure as mayor of Burlington, I defeated Democrats and Republicans and helped start a third-party movement. Today there is a statewide progressive party which now has three people in the state Senate, out of 30, and a number of representatives in the state Legislature. But that process has taken 30 years. So it is not easy. If you look back to Nader’s candidacy [in 2000], the hope of Nader was not just that he might be elected president but that he would create a strong third party. Nader was a very strong candidate, very smart, very articulate. But the strong third party did not emerge. The fact is that is very difficult to do. You plan to travel, to spend time with activists in the Democratic Party and outside the Democratic Party. Will you look to them for direction? Yes. The bolder, more radical approach is obviously running outside of the two-party system. Do people believe at this particular point that there is the capability of starting a third-party movement? Or is that an idea that is simply not realistic at this particular moment in history? On the other hand, do people believe that operating in framework of the Democratic Party, getting involved in primaries state-by-state, building organization capability, rallying people, that for the moment at least that this is the better approach? Those are the options that I think progressives around the country are going to have to wrestle with. And that’s certainly something that I will be listening to. You have always been identified as a democratic socialist. Polling suggests that Americans are not so bothered by the term, but it seems to me that our media has a really hard time with it. Is that a factor in your thinking about a presidential race? No, that’s not a factor at all. In Vermont, people understand exactly what I mean by the word. They don’t believe that democratic socialism is akin to North Korea communism. They understand that when I talk about democratic socialism, what I’m saying is that I do not want to see the United States significantly dominated by a handful of billionaire families controlling the economic and political life of the country. That I do believe that in a democratic, civilized society, all people are entitled to health care as a right, all people are entitled to quality education as a right, all people are entitled to decent jobs and a decent income, and that we need a government which represents ordinary Americans and not just the wealthy and the powerful. The people in Vermont know exactly when I mean, which is why I won my last election with 71 percent of the vote and carried some of the most conservative towns in the state. If I ran for president, and articulated a vision that speaks to working people, I am confident that voters in every part of this country would understand that. The truth is that, very sadly, the corporate media ignores some of the huge accomplishments that have taken place in countries like Denmark, Finland, Sweden and Norway. These countries, which have a long history of democratic socialist or labor governments, have excellent and universal health care systems, excellent educational systems and they have gone a long way toward eliminating poverty and creating a far more egalitarian society than we have. I think that there are economic and social models out there that we can learn a heck of a lot from, and that’s something I would be talking about. My whole life in politics has been not just with passing legislation or being a good mayor or senator, but to educate people. That is why we have hundreds of thousands of people on my Senate email list, and why I send an email to all Vermonters every other week. It is why I have held hundreds of town meetings in Vermont, in virtually every town in the state. If you ask me now what one of the major accomplishments of my political life is, it is that I helped double the voter turnout in Burlington, Vermont. I did that because people who had given up on the political process understood that I was fighting for working families, that we were paying attention to low and moderate-income neighborhoods rather than just downtown or the big-money interests. In fact, I went to war with virtually every part of the ruling class in Burlington during my years as mayor. People understood that; they said, “You know what? Bernie is standing with us. We’re going to stand with him.” The result is that large numbers of people who previously had not participated in the political process got involved. And that’s what we have to do for the whole country. One of the things that I find most disturbing—in fact, beyond comprehension—is that the Democrats now lose by a significant number the votes of white working-class people. How can that be? When you have a Republican Party that wants to destroy Social Security, Medicare, Medicaid, ect., ect., why are so many people voting against their own economic interests? It happens because the Democrats have not been strong in making it clear which side they are on, not been strong in taking on Wall Street and corporate America, which is what Roosevelt did in the 1930s. So, to me, what politics is about is not just coming up with ideas and a legislative program here in Washington—you need to do those things—but it’s about figuring out how you involve people in the political process, how you empower them. It ain’t easy, but that is, in fact, what has to be done. The bad news is that people like the Koch brothers can spend huge sums of money to create groups like the Tea Party. The good news is that, once people understand the right-wing extremist ideology of the Koch brothers, they are not going to go along with their policies. In terms of fundamental economic issues: job creation, a high minimum wage, progressive taxation, affordable college education—the vast majority of people are on our side. One of the goals that I would have, politically, as a candidate for president of the United States is to reach out to the working-class element of the Tea Party and explain to them exactly who is funding their organization—and explain to them that, on virtually every issue, the Koch brothers and the other funders of the Tea Party are way out of step with what ordinary people want and need. You have made it very clear that you have no taste for personality politics. But a part of why you are thinking of running for president has to be a sense that the prospective Democratic candidates are unlikely to do that or to do that effectively. Is it your sense that Hillary Clinton, the clear front-runner at this point, is unlikely to do that? Look, I am not here to be attacking Hillary Clinton. I have known Hillary Clinton for a number of years; I knew her when she was first lady a little bit, got to know her a little bit better when she was in the Senate. I like Hillary; she is very, very intelligent; she focuses on issues. But I think, sad to say, that the Clinton type of politics is not the politics certainly that I’m talking about. We are living in the moment in American history where the problems facing the country, even if you do not include climate change, are more severe than at any time since the Great Depression. And if you throw in climate change, they are more severe. So the same old same old [Clinton administration Secretary of the Treasury] Robert Rubin type of economics, or centrist politics, or continued dependence on big money, or unfettered free-trade, that is not what this country needs ideologically. That is not the type of policy that we need. And it is certainly not going to be the politics that galvanizes the tens of millions of people today who are thoroughly alienated and disgusted with the status quo. People are hurting, and it is important for leadership now to explain to them why they are hurting and how we can grow the middle class and reverse the economic decline of so many people. And I don’t think that is the politics of Senator Clinton or the Democratic establishment…. People want to hear an alternative set of policies that says to the American people: with all of this technology, with all of this productivity, the truth of the matter is that the average person in this country should be living better than ever before—not significantly worse economically than was the case thirty years ago. That’s what we need. That’s what I want to talk about… I think that the class message, that in this great country, especially with all kinds of new technology and increased productivity, that we can in fact provide a decent standard for all people, I think that resonates in fifty states in America. I think what people are looking for is leadership that is prepared to take on the big money interests (to deliver that message). That’s not what we’re seeing, by and large, from most Democrats. I think so. My experience and my political instinct tells me that a lot of the discussions about 2016 are minimizing the profound disgust that people are having now with the status quo—and they’re desperate for a message that addresses that disgust. If I run, I’m not going to be raising hundreds and hundreds of millions of dollars. I think I have the capability of raising a lot of money and that’s important, but that at the end of the day is not going to be what’s most important. What’s most important is this idea of a political revolution—rallying the working families of this country around a vision that speaks to their needs. People need to understand that, if we are prepared to stand up to Wall Street and the big-money interests, we can create a nation that works for all Americans, and not just the handful of billionaires. You speak frequently about this idea of a “political revolution.” What do you mean by that? We have to take a deep breath and look at what politics in America today is all about. First of all, in off-year elections—nonpresidential elections—you’ll have 50 to 60 percent of the people not voting. So the first thing, the obvious argument about the need for a political revolution, is that in a democratic society, we need the vast majority of the people to participate in the political process. If we had an 85 to 90 percent voter turnout, as countries like Denmark do, the nature of politics would be fundamentally different—because lower-income and working-class people would be involved and would be fighting for their interests. Second of all, when you look at politics today, you have the absurdity of any billionaire, any millionaire out there saying, “I want to run for office.” You hire a consultant, you put some TV ads on and you are, according to the media, a serious candidate because you’re rich. Very few campaigns now revolve around candidates who have strong grassroots support. When we talk about a political revolution, we have to talk about political consciousness, which is abysmally low. You do polling and you find out that people do not even know the name of the person who represents them in Congress…. If you don’t know which party controls the House and Senate, how do you form a judgment, how do you evaluate what’s going on in Washington? Furthermore, all of us take for granted the fact that when you turn on talk radio, it is overwhelmingly right-wing, and some of it is incredibly extreme right-wing. There are parts of America today where if you turn on the radio, you cannot hear anything vaguely representing a progressive voice. In addition to that, of course, we have a major television network, Fox, that is an adjunct of the Republican Party. So when I talk about a political revolution, what I am referring to is the need to do more than just win the next election. It’s about creating a situation where we are involving millions of people in the process who are not now involved, and changing the nature of media so they are talking about issues that reflect the needs and the pains that so many of our people are currently feeling. Essentially, what a political revolution means is that we organize and educate and create grassroots movements, which we certainly do not have right now. Do you believe a campaign can be the catalyst for developing the consciousness and the movement that can achieve that change? A campaign has got to be much more than just getting votes and getting elected. It has got to be helping to educate people, organize people. If we can do that, we can change the dynamic of politics for years and years to come. If 80 to 90 percent of the people in this country vote, if they know what the issues are (and make demands based on that knowledge), Washington and Congress will look very, very different from the Congress currently dominated by big money and dealing only with the issues that big money wants them to deal with. The Rev. Jesse Jackson ran an outsider campaign in 1988 that talked about trying to open the process. You were a part of that. Do you see a connection to what you are talking about now? Absolutely. I think Jackson has not gotten the credit he deserves. His campaigns were revolutionary: we had an African-American minister going to states like Iowa—predominantly white states—and rallying farmers. He came to Vermont; I remember I introduced him, and we had hundreds and hundreds of people out to hear him speak in a state that was then virtually all-white. The idea of bringing together people—the Rainbow Coalition concept of whites, blacks, Hispanics, Asians, gays and lesbians—is absolutely right, and the emphasis, in my view, can be on economic issues. I happen to believe that the frustration and disgust with the status quo is much, much higher now—much, much higher than many “pundits” understand. The job right now, the main focus, is to bring people together from an economic perspective, on class lines, and talk about an America that works for the vast majority of our people and not just the top 1 percent. John Nichols is the author, with Robert W. McChesney, of Dollarocracy: How the Money and Media Election Complex is Destroying America (Nation Books), for which Senator Bernie Sanders wrote an introduction.